“Revealing Her Story: Documenting African American Women Intellectuals” is a two-year project funded by the National Historical Publications and Records Commission to arrange and describe the personal papers of nine African American women writers, artists and musicians. Collections included in the project are the Pearl Cleage papers; additions to the Delilah Jackson papers; the Samella S. Lewis papers; the Almena Lomax papers; the May Miller papers; the Undine Smith Moore papers; the Geneva Southall papers; the Mildred Thompson papers; and the Sarah E. Wright papers. To read the press release announcing the project, click here. Mildred Jean Thompson–African American painter, sculptor, printmaker, musician, and photographer–was born in Jacksonville, Florida, in 1936. 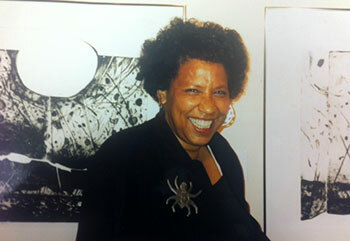 Her art education began at Howard University in the 1950s, where she worked with James A. Porter. After studying for a few years at Howard and at other art programs, Thompson was eager for an opportunity to train in Europe. She optimistically applied for a Fulbright Scholarship, but when her application was turned down she resolved to do whatever was necessary to go to Europe on her own. She earned enough money at a summer teaching job to cover her travel costs, and in September of 1958 she boarded a ship to Germany alongside the students who had received Fulbright Scholarships. Thompson arrived in Hamburg, knowing no one and with no place to stay, and enrolled at the Hochschule für bildende Künste Hamburg. After studying for three years in Germany and Italy, Thompson returned to New York, ready to work independently and eager to reenter the American art scene. She sold some prints to the Museum of Modern Art and the Brooklyn Museum, a testament to her talent, but Thompson nevertheless became frustrated by her encounters with various galleries and museums. She soon came to the realization that many people in the New York art scene of the early 1960s were not ready to accept a female African American artist. One art dealer suggested that Thompson look for a job designing Christmas cards because it would be impossible for her to have a show in New York. 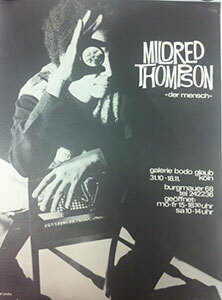 Another gallery owner told Thompson that he liked her work, but that “it would be better if [she] had a white friend to take [her] work around, someone to pass as Mildred Thompson.” After a few years Thompson became disillusioned and returned to Germany, settling in Düren. The Mildred Thompson papers are processed and open to researchers. Reference: All quotations are from Thompson, “Mildred Thompson, Sculptor: Experiences of a Black Artist in Europe and the United States,” Black Art International, 1977, Mildred Thompson papers, Manuscript, Archives, and Rare Book Library, Emory University.